limedragon :) » Blog Archive » Santa drinks Starbucks! We’ve spotted Santa at Starbucks a few times while Mom and I were mall-walking. The first time it happened, I tried to double back and and nonchalantly shoot a picture with my Treo camera. However, he saw me through the window and waved. I was too embarrassed to bother with a picture and sheepishly went on with my walk. The next time we walked by Starbucks (the one located on the Second Level, West Market Street, across from Eddie Bauer), Mom saw him and decided to go inside and ask him his permission for a picture. He graciously obliged. In other news… I noticed that this blog’s number of comments is approaching the 2,000 mark. I hope to reach it before the end of the year. If someone leaves the 2,000th comment on or before December 31, 2007, I’ll award a $20 gift certificate to that person. The winner will be able to choose a certificate from one of the following: Amazon, The Loopy Ewe, or Woolgirl. Will you be the lucky commenter?? Wow, you have to come check out my blog Harriet and see where we bumped into Santa this weekend. That’s too funny. 2000?! Wow, fast how it goes huh? Gotta love a Santa that looks like the genuine article! Maybe you should have a contest for random Santa sightings? 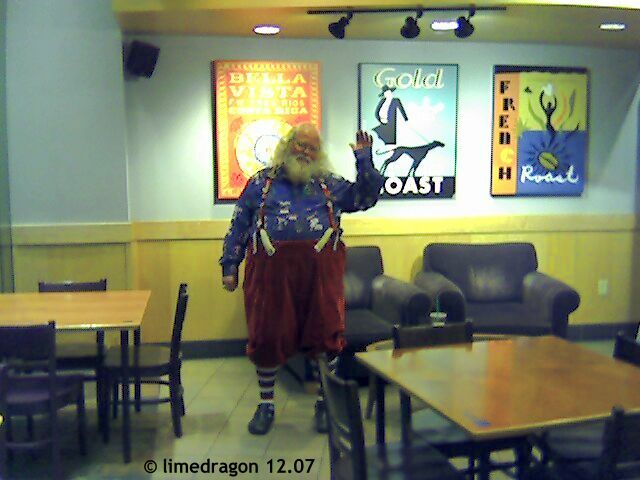 When you consider the time of year, and Santa’s schedule, I guess it no surprise that he’s been spotted at Starbucks. They guy must go through an awful lot of coffee between Thanksgiving and Christmas. Too funny. I guess it is true that he is always watching. Best be on your best behavior!! That is one of the biggest Santa’s I have seen around! wow if I ever come anywhere close to 2k comments I will have to write for 80 more years. Well Santa have a lot to do between now and Christmas, so he’s going to need lots of coffee. Besides those ginerbread lattes are pretty good. Santa probably needs all the caffeine he can get right now! I love me a good contest! :) Love all the Christmas everywhere.